Can you talk about your experience as a Punjabi Sikh and your struggles working in the arts? Rupi Kaur: It’s something that we touch base on all the time, and only recently it’s become a lot easier. Starting off, you don’t see yourself in this field or doing the arts because it’s not meant for you. And everyone doing it doesn’t look like you. So it’s a very foreign concept to put yourself out there and be like hey - I am a painter or I am a musician. Because in the Western world, no musician or no painter looks like you. It’s something that we explored. Kirn Rai Kaur: I think for myself especially, being a Punjabi female Sikh actor, it is difficult to see people who look like me on screen. Even playing a lead was something that I never thought would happen. When you look at main street media, even if you look at Bollywood - you do not really see Sikh Punjabi faces. It was really foreign to me to even think that this was a possibility. I always saw myself playing the side roles, not even taking the lead to be a director and producing my own stuff and my own content. I thought that was a distant dream. And now that we have been able to see how the work that we’ve done and what we’ve done together, we’ve been able to understand - this is very possible for us to be able to do this. Rupi Kaur: I think at first we looked at it as a disadvantage. Like - we’re brown and we’re women, it’s so much harder. But then, we have come to a realization - we’re so different than the larger mainstream society and that is such a great thing. It’s an asset. You have stories and you have experiences that most people don’t have. As a writer, I can talk about all these things that so many of my counterparts won’t be able to talk about. Because they haven’t had these experiences of being colored within the society, or being an immigrant within the society. And so that’s how you really got to take it. Use your differences as your weapon, and not as a disadvantage. Kirn Rai Kaur: I think honestly - find your story. Through ourselves - we have been able to use our art to tell our stories and expressions to explain the diasporic stories. All the work that I ever do is inspired by the diaspora, and what we’ve struggled with, and having immigrant parents - what that’s like. Being able to express those stories within art has allowed people to feel like they can relate to it. And you realize that - you’re not the only one who is going through this. There are so many people that need this, that are starving for this kind of art. Rupi Kaur: Whole generations. I look at the first generation of settlers. There is something so unique about them and they’re so hungry. And it’s because of the fact - that you leave home to find home here. But you come here and everyone here says this isn’t home because home doesn’t look like you. But then you go back “home” - and everyone there is like - you’re too different. So this is not your home. So - we are a generation of folks that are in this middle place in between this bridge being pulled apart into both places. It is so crucial and it is so important to document that. Because there is only ever going to be one first generation in your family. No one is going to document that story better than you because you are that authentic voice. 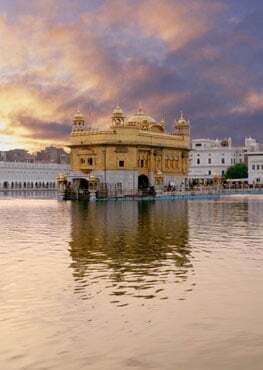 Is there anything from Sikhi itself, or the Guru, that has helped or inspired you? Or that you, in your personal life, latch onto or within your heart? Kirn Rai Kaur: I think the key honestly for me is beyond dimensions. I think that I’ve learned so much about Sikhi within my journey. I want to aspire to grow and understand more about my truth and understand what it’s like to have this Universal energy. And what it’s like to really understand equality and how do you look at someone as Wahe Guru, as well. I got really spiritual there. But I feel like that is what it’s like for me. I am constantly learning. And being a Sikh woman - how do we show the face of Sikh women? What does that look like? We are so used to seeing images of Sikh men and know exactly what it’s like. When we refer to Sikhs, we always think of a Sikh male. And that means a dastaar and a beard. We don’t really get a chance to understand what Sikh females look like. And we haven’t been able to explore that until recently. I think with women coming on the forefront, we are able to now change the dialogue. Rupi Kaur: I think there’s so much a lot of people miss. For example, growing up, there was something that I missed. I never had the time to explore it by myself. I just took everything that was thrown at me. “This is what Sikhi is. And this is what you’re supposed to do if you’re a Sikh.” Like - there were so many rules and it was so rigid, that automatically I thought, “OK. 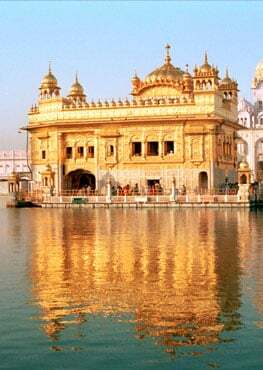 I don’t feel like I fit into this.” But as I am learning over the years, Sikhi encompasses so much of what I do and what I believe in. The idea of equality. Learning that Guru Naanak was a feminist in the 1400’s. How crazy is that. I was in the English program, and we were reading Canterbury Tales. My professor was talking about how forward that writing was. And I thought - this is so misogynistic. But then I felt so proud because Guru Naanak was walking around Pakistan and he was light years ahead of all of this. And learning that Guru Gobind Singh ji hired poets to create literature. Sikhi values - poetry, art, writing - all of that - makes me feel so grounded in the work that I do. The Guru Granth Sahib is this immaculate book of poetry at the end of the day. That’s so moving and that’s so inspiring. There is something in Sikhi for everybody. And we just have to be accepting and open, and allow everyone to find their own path in it, because that’s what it’s about. Kirn Rai Kaur: I think that’s a real important topic to discuss. We have become narrow-minded on what Sikhi is and how do we influence other people. Rupi Kaur: People are like - we are just trying to protect it. So we are going to be more rigid. Kirn Rai Kaur: We need to be more supportive in people’s journeys in allowing it. Because when we are boxing people in and what ideals we think Sikhi are - we feel are our own ideals. Rupi Kaur: Then people do not want to have anything to do with it. Kirn Rai Kaur: People like myself and Rupi have had an opportunity to explore it on our own. And it is much more rewarding in that sense. I think now we are connected in a whole different level. Rupi Kaur: I was at a point where I lost all touch with it. Coming back into it on your own - there’s nothing like it. Kirn Rai Kaur: All the work that I do is inspired by Sikhi. The themes that I come up with. The stories behind it. What do I want to share with the world - it is all based on Sikh principles. What is your message for the youth? Kirn Rai Kaur: I feel that we have had the experience of struggling through so many hardships trying to get where we are right now. But I want all of you to know that we are doing it for you. So it’s easier for you to pursue the arts. As it wasn’t for us. I feel like I’ve been doing it for the youth. I want to be the role model that I didn’t have. That’s important for the youth to understand - that you do see all these Sikh artists that are arising. Or all these Sikh role models that are in different fields. Whether it be politicians. Whether it be business men or women. Whether it be artists. You can pursue anything you really truly want. Rupi Kaur: It is easier now than ever, I think. With the resources. With the technology we have. It’s only getting more and more affordable, more and more accessible. Had I seen a Punjabi Sikh woman do spoken word poetry within the modern world - had I seen that growing up - I think I would have gotten into it a lot sooner. We meet so many folks throughout our journey. Everyone has an artist sitting inside of them. As a human being, you are an artist. You have art within in your blood. Explore that and share that - make the world a beautiful place. We pollute the world so much. Our giving of our art is a way to reverse that pollution and give back in a positive way. Kirn Rai Kaur: Keep it going, kids.